Get divorced in as little as 3 weeks. Finalize your divorce without going to Court. Receive your signed Decree from the Court by mail. To obtain a divorce in Virginia, one of the spouses must be a resident of Virginia for at least 6 months before the divorce is filed. The no-fault grounds for divorce in Virginia requires that the spouses must be separated for 6 months before filing for divorce. If there are minor children, the spouses must be separated for 1 year before filing for divorce. Virginia is one of the easier states for getting divorced. DivorceWriter will provide you with the Affidavits you need to complete your divorce without ever going to Court. Divorce by Affidavit makes the whole process easier for you and for the judges, which is why there are only a couple of counties in Virginia that require a hearing instead of Affidavits to finalize a divorce. 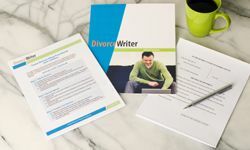 DivorceWriter knows which counties don't allow Affidavits and in those counties, we will provide you with everything you need to schedule and be prepared for your brief Court hearing. You have qualified to use DivorceWriter to complete your Virginia divorce papers online. Select "Continue" to start the interview.